» Happy horses in winter? These horses look happy to you? They did to me when I snapped the photo on a bike ride outside of Medford a few weeks ago. Maybe not deliriously happy, but at least content. I’m no expert on keeping horses, but these animals looked as though they had, if nothing else, a big enough pasture in which to roam. This was on my mind because we’re only a few weeks away from the rainy season, and in about three months it will be winter. 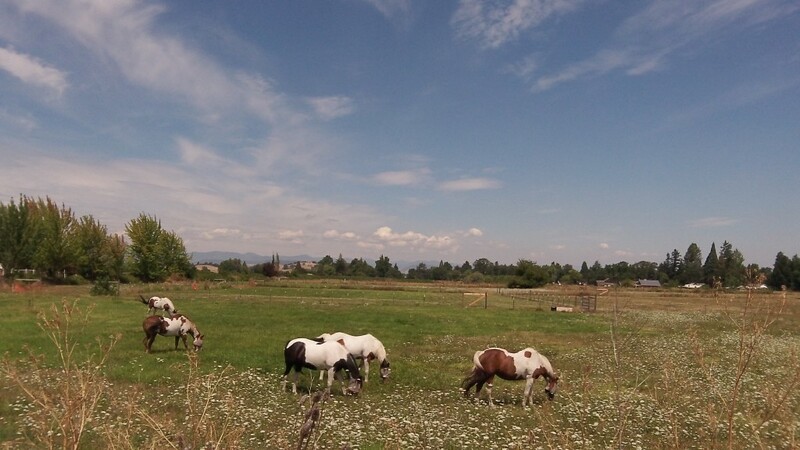 In past winters around here in the Willamette Valley, I’ve seen horses standing around in yards that seem to me to be far too small. They stand there with their heads down and up to their fetlocks in mud. The ground has been soaked since the first rains of fall, and the horse’s hooves have long turned it into a gooey mush. I don’t know if there is some standard for the minimum amount of space it takes to keep a horse. But you’d think the yard or pasture for even just one horse ought to be big enough so it does not stomp around in the same spot until the ground becomes a swamp.